We’d love your help. Let us know what’s wrong with this preview of Lord Demon by Roger Zelazny. Roger Zelazny (1937-1995) was a wizard of the pen: he won six Hugos and three Nebulas and is revered by science fiction and fantasy readers. Lord Demon is his last novel, the second of two projects unfinished at his death. Jane Lindskold, his partner and a fantasy author herself, completed it from some manuscript, a few notes, and conversations she'd had with him. Fans are Roger Zelazny (1937-1995) was a wizard of the pen: he won six Hugos and three Nebulas and is revered by science fiction and fantasy readers. Lord Demon is his last novel, the second of two projects unfinished at his death. Jane Lindskold, his partner and a fantasy author herself, completed it from some manuscript, a few notes, and conversations she'd had with him. Fans are often skeptical of posthumous collaborations: "It's not real Zelazny"--but Lord Demon comes darned close. It deserves space beside the Amber series, The Dream Master, and Lord of Light. As Zelazny once said of another novel: "It has all my favorite things--blood, love, fire, hate and a high ideal or two." Lord Demon is vintage Zelazny: a "scientific" fantasy built on favorite themes (the necessity of knowing oneself, of taking risks, and of accepting the vulnerability that comes with feeling passionately), drawing on East Asian, Irish, and hero's quest myths, and featuring his signature protagonist: erudite, smart-mouthed, detached, homicidal when roused but more often immersed in art, poetry, and the creation of alternate realities; unexpectedly kind to the weak and deeply romantic in his approach to women. The bad puns and wildly whimsical turns the story takes are also characteristic. To ask other readers questions about Lord Demon, please sign up. This book was started by Roger Zelazny and finished by Jane Lindskold after his death. I've given the book 3 stars, but it started out as a solid 5. The premise was great. The character of Kai Wren, Lord Demon, was great. Then Zelazny had to go and die, and Lindskold took over. The worst part of it all is that I'm fairly certain I can pinpoint the exact moment at which Zelazny stopped writing and Lindskold started. (I'll mention it in a "spoiler" section below -- I don't want In a word: depressing. Anyway, once Lindskold took over, the characters became a little . . . over-dramatic. Zelazny's protagonists are always cool and calm, even in the face of danger or sorrow--we get the idea that they may be feeling pain on the inside, but they try not to let it show, and that makes them all the more interesting. Just look at Corwin of Amber or Conrad Nomikos, to name a few. Once Lindskold took over, everyone (not just Kai Wren) started being much more animated. She added lots of unnecessary adverbs to her dialogue tags (if one more person says something "indignantly," I'm going to shoot myself). Now, one could argue that this was an intentional change based on the plot of the book, but it wouldn't explain why every character started acting differently at once (unless they were all under some magic spell that we don't know about). Li Piao, for example, had the feeling of a wise old man early on. He lost a lot of his mystique when he started saying things "indignantly" or with any other adverb (that's just the one that comes to mind because it was said so damn often; it's a strong word, so it's noticeable if overused). Another beef I had with the book (and this could very well have been Zelazny's doing, as it could have stemmed from his notes) was that a lot of things were fixed by magical means and it seemed like a cop-out. It seemed like the characters never had to struggle their way through a problem. "How are we going to get out of this?" "Luckily, I have a spell that will do just the right thing! Isn't that convenient? Again?" Once again, this could have been Zelazny's intent, as it's a plot point more than a style point. But I'm pretty sure I never noticed this gross misuse of power in Zelazny's sections . . .
My interest dropped GREATLY after chapter 10 (and no, that's not where the Zelazny/Lindskold split was--I believe the split came earlier than that). There was a lot of moving between planes and whatnot, and I lost track of where people were and who had which objects of power in their possession. Mind you, this isn't necessarily because it was poorly described--it was more likely because I was just so disinterested by that point that I wasn't about to put any effort into following what was going on. For this reason, the last ~90 pages of the 276-page book were disappointing. And that's very frustrating, considering it definitely started out as a 5-star book and had a great premise. I haven't read any of Lindskold's other work, and now I'm reluctant to do so, though I imagine I'll still give Donnerjack a whirl some day. I can say with relative certainty that Zelazny stopped writing after chapter VI. After reading a few pages of chapter VII, I sort of did a double-take and went back, and that's when it hit me--the Zelazny goodness had ended, and we were in Lindskold territory. It was frustrating, but I accepted it and the book was still fairly interesting for the next four chapters. It was in those chapters that it dropped from 5 stars to 4. Then, from chapter XI to the end, we lost another star. Lord Démon est un roman de Roger Zelazny publié à titre posthume et finalisé par sa femme Jane Lindskold, ce qui explique que celle-ci soit créditée comme auteur. Zelazny est bien sûr connu pour saga des Princes d’Ambre mais aussi pour une multitude d’autres romans dont certains lui valurent le prestigieux prix Hugo. On retrouve dans Lord Démon ce qui a définit le style de l’auteur, à savoir l’intrusion de la mythologie dans un univers contemporain. Lord Démon est l’histoire de Kai Wren, souffleu Lord Démon est un roman de Roger Zelazny publié à titre posthume et finalisé par sa femme Jane Lindskold, ce qui explique que celle-ci soit créditée comme auteur. Zelazny est bien sûr connu pour saga des Princes d’Ambre mais aussi pour une multitude d’autres romans dont certains lui valurent le prestigieux prix Hugo. On retrouve dans Lord Démon ce qui a définit le style de l’auteur, à savoir l’intrusion de la mythologie dans un univers contemporain. Lord Démon est l’histoire de Kai Wren, souffleur de verre et démon depuis plusieurs siècles. Il est surnommé « l’exterminateur de dieux » en référence aux guerres qui ont opposé dieux et démons dans un passé lointain. Retiré de sa communauté d’appartenance, il passe son temps reclu dans sa bouteille magique, à fabriquer des objets en verre qu’il enchante grâce à son chi. Un beau jour son serviteur humain est assassiné, ce qui va le pousser à sortir de sa tanière et à affronter le monde extérieur. Lord Démon remixe, avec une habileté variable, la mythologie chinoise pour nous en proposer une version prémâchée a priori comestible et divertissante. On voit défiler dans le roman des Taoïstes, du feng shui, des dragons et bien d’autres choses pour émerveiller petits et grands. Zelazny est complètement décomplexé dans cette approche et charcute les mythes à sa guise pour en faire un pur roman de fantasy. One of Zelazny's trademarks is the ability to write about his superhuman characters and fantastic worlds so matter-of-factly that we can believe in their existence, no matter how distant they might seem (in the hands of a lesser author) from ordinary life. When this is done well, as it is in most of Amber, Lord of Light, and especially in his short stories, we never notice the tension between the wild imagination of the scenario and the realism of the writing. In Lord Demon, this tension is appa One of Zelazny's trademarks is the ability to write about his superhuman characters and fantastic worlds so matter-of-factly that we can believe in their existence, no matter how distant they might seem (in the hands of a lesser author) from ordinary life. When this is done well, as it is in most of Amber, Lord of Light, and especially in his short stories, we never notice the tension between the wild imagination of the scenario and the realism of the writing. In Lord Demon, this tension is apparent from the first dialogue, in which the immortal demon protagonist discusses pizza toppings with his 300-year-old servant. The combination of the high mythic and the mundane is frequently amusing - and a novel can certainly do worse than amuse - but rarely believable. The story itself is classic Zelazny, with a powerful but slightly naive hero navigating the politics and intrigues of his fellow immortals. In fact, it reads a bit like a pastiche of his earlier works (particularly Lord of Light), and at times even explicitly references them. At risk of making some persons exceptionally angry, I can say that what makes me interested in Roger Zelazny is just about everything that is not his well-known Amber series. Lord Demon has some similarities to the Amber books but draws on the same information in a more complete manner. Kai Wren, the Lord Demon, is a more fully developed character throughout the book - some may argue co-writer Jane Lindsgold played a part in that. In any case, Zelazny's inspirations (East Asian myths, etc.) are At risk of making some persons exceptionally angry, I can say that what makes me interested in Roger Zelazny is just about everything that is not his well-known Amber series. Lord Demon has some similarities to the Amber books but draws on the same information in a more complete manner. Kai Wren, the Lord Demon, is a more fully developed character throughout the book - some may argue co-writer Jane Lindsgold played a part in that. In any case, Zelazny's inspirations (East Asian myths, etc.) are obvious in Lord Demon and seem to actually serve a purpose. And there are dogs! The main character Kai Wren is a glassblower who creates entire worlds inside the bottles he makes; worlds in which many of his demon-friends live, each inside their own bottle. Lord Demon appeals to me because of its contemporary nature and adult-like subject matter. The personal interactions and learning experiences of Zelazny’s characters are much like those of human beings, instead of what we’d expect from a typically-crafted, supernatural demon. In this way, he creates characters to which we The main character Kai Wren is a glassblower who creates entire worlds inside the bottles he makes; worlds in which many of his demon-friends live, each inside their own bottle. Lord Demon appeals to me because of its contemporary nature and adult-like subject matter. The personal interactions and learning experiences of Zelazny’s characters are much like those of human beings, instead of what we’d expect from a typically-crafted, supernatural demon. In this way, he creates characters to which we can relate, and from which we can learn lessons in friendship, trust, and the balance between those values and self-protection. I have recently reread this book, and I found it better than I remembered. Which is not to say it is good, just that it is not too bad. The story is vintage Zelazny, a powerful immortal that gets caught in a bad situation. This time the setting is (very loosely) based in ancient China, but it does not really matter. Like most books finished post-mortem, there are some sparks of the author, but spread among old ideas, simple plots and in this case the feeling that the book does not know whether to I have recently reread this book, and I found it better than I remembered. Which is not to say it is good, just that it is not too bad. The story is vintage Zelazny, a powerful immortal that gets caught in a bad situation. This time the setting is (very loosely) based in ancient China, but it does not really matter. I really enjoyed reading this and I really wished Zelazny had survived to see it through publication. I think it would have been better if he'd lived long enough to properly finish it. As it stands, Lord Demon is imaginative and epic and full of fascinating characters and cultures, and just choppy enough and full of uneven loose ends to keep me from falling in love with it utterly. It's highly worth reading and I'll look forward to reading it again, but if anything it's strongest in that it make I really enjoyed reading this and I really wished Zelazny had survived to see it through publication. I think it would have been better if he'd lived long enough to properly finish it. 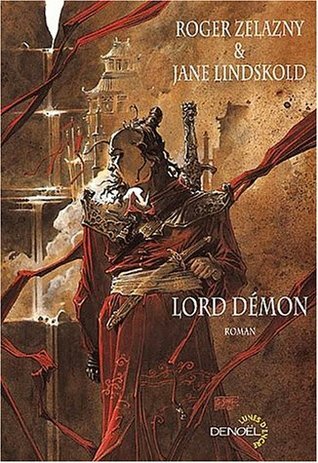 As it stands, Lord Demon is imaginative and epic and full of fascinating characters and cultures, and just choppy enough and full of uneven loose ends to keep me from falling in love with it utterly. It's highly worth reading and I'll look forward to reading it again, but if anything it's strongest in that it makes me want to go back through Zelazny's bibliography and read all his works I'd never gotten around to reading before. Kai Wren is a glass blower, bottle maker, master swordsman, and demon. Not just any demon, but Lord Demon the Godslayer. His bottles enfold universes, large and small. But a thousand years of peaceful living have just been shattered: his servant, and friend, Oliver O'Keefe, has been murdered. Wren's search for revenge, and perhaps justice, takes him down a path that leads to further loss, friendship, betrayal, love, and perhaps the salvation of the demon race. A nice read, one of Zelazny's last, Kai Wren is a glass blower, bottle maker, master swordsman, and demon. Not just any demon, but Lord Demon the Godslayer. His bottles enfold universes, large and small. But a thousand years of peaceful living have just been shattered: his servant, and friend, Oliver O'Keefe, has been murdered. Wren's search for revenge, and perhaps justice, takes him down a path that leads to further loss, friendship, betrayal, love, and perhaps the salvation of the demon race. I enjoyed this book because it was simple and fairly similar to other Zelazny work. I found out that it was finished posthumously while I was reading the book but I don't think that distracted from the story. The writing must have been edited really well or Lindskold copies his writing very, very well. The little synopsis in the box up there sums it up pretty well. I loved having such different characters. I wish the idea of mixed blood and "weaker" powers had been addressed more but the book has I enjoyed this book because it was simple and fairly similar to other Zelazny work. I found out that it was finished posthumously while I was reading the book but I don't think that distracted from the story. The writing must have been edited really well or Lindskold copies his writing very, very well. IIRC, this and Donnerjack are the two Zelazny books published posthumously. I rescued a bunch of books from Jody, and my re-read of this one, however, was a great experience. Maybe it's time to look for Donnerjack again. The book does a great job of scratching the Zelazny itch - alternate worlds, powerful but ignorant protaganist, great science fantasy setting... Highly recommended. Back when I was in my teen sci-fi phase, for some reason I never read much Zelazney. Now I'm making up for the oversight - the guy was wildly imaginative and could really turn a fine sentence. I would have given this one 4 stars if it hadn't been for the obvious and clumsy hand of his co-writer/biographer, who helped him finish this last book before he kicked it. Still, it's a fine page-turner of an adventure story with lots of fun elements from Chinese mythology. Recommended. This review has been hidden because it contains spoilers. To view it, click here. This contribution is not Zelazny's best work, which can be guessed ever since the protagonist discloses he has access to three wishes of almost absolute power. The deus ex machina can be heard coming pages away. I hadn't read it in a while so I decided to exhume it, and even if it's an enjoyable read, I think I could have spent my time better. Recommended if you have nothing else to do. Posthumously finished by his companion Jane Lindskold, Roger Zelazny's "Lord Demon" is an excellent piece of what Zelazny did best - enjoyable, human characters written on a superhuman scale. The conception of the demons and gods and the dimensions surrounding ours meshes with the story. Written with an enjoyable understanding of the cultures and societies both real and imagined. Enter a world of magic and mystery, gods and demons as we are sucked into the mystical realm of Kai Wren. He is a demon of some renown; Slayer of gods, bottlemaker, avid kite flyer, and the "Lord Demon," Kai Wren is forced to survive on wit alone when factions within demon society turn against him, stripping him of his powers and forcing him to the Earthen plane...as a mortal. Very interesting book- very good zelazny. Creates yet another beautiful/mystic world that is very creative, and astounding to read. Like all of roger zelazny's books (besides the wild west one that I haven't read yet), this is a must read. It wasn't as good as the other Zelazny books. If felt a little unpolished. It worked for me because I like the Main Character and the idea, but the execution could have been better. At parts it was really good, then it lapsed into very boring. Zelazny was working on this book when he died, after asking Jane Lindskold to finish it for him. It's pretty seamlessly in his voice, but IMHO has a little more emotional depth than most of his books, which may perhaps be attributed to her. Any of his fans or hers should enjoy this book. Very entertaining sf/fantasy novel about a demon who's trying to figure out who is out to get him. The answer, of course, surprises Lord Demon more than the reader, but the path to discovery is full of sorcery, suspense, and humor. Light reading to be sure but much fun. Loved this book so much that I didn't want it to end. Some parts seems out of place in the story but not so bad that it changed my view of the book. Good. I had never read any Zelazy, and I really enjoyed it. The descriptions were vivid and the characters interesting although the females were at times a bit cliched. An amazing book with incredible story and plot twists, filled with wonder and laughter, as well as very likable and relatable charachters. It is Amazing ! A fairly enjoyable fantasy, finished by Lindskold after Zelazny's death. The changeover isn't seamless, and hers isn't as good as his. Roger Zelazny made his name with a group of novellas which demonstrated just how intense an emotional charge could be generated by the stock imagery of sf; the most famous of these is A Rose for Ecclesiastes in which a poet struggles to convince dying and sterile Martians that life is worth continuing. Zelazny continued to write excellent short stories throughout his career. Most of his novels dea Roger Zelazny made his name with a group of novellas which demonstrated just how intense an emotional charge could be generated by the stock imagery of sf; the most famous of these is A Rose for Ecclesiastes in which a poet struggles to convince dying and sterile Martians that life is worth continuing. Zelazny continued to write excellent short stories throughout his career. Most of his novels deal, one way or another, with tricksters and mythology, often with rogues who become gods, like Sam in Lord of Light, who reinvents Buddhism as a vehicle for political subversion on a colony planet. The fantasy sequence The Amber Chronicles, which started with Nine Princes in Amber, deals with the ruling family of a Platonic realm at the metaphysical heart of things, who can slide, trickster-like through realities, and their wars with each other and the related ruling house of Chaos. Zelazny never entirely fulfilled his early promise -who could?- but he and his work were much loved, and a potent influence on such younger writers as George R. R. Martin and Neil Gaiman. He won the Nebula award three times (out of 14 nominations) and the Hugo award six times (out of 14 nominations). His papers are housed at the Albin O. Khun Library of the University of Maryland, Baltimore County (UMBC).